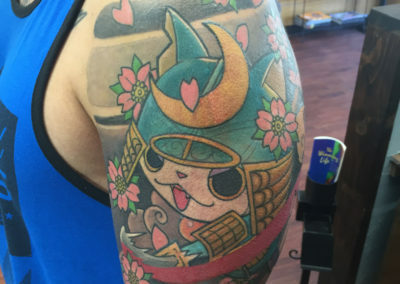 If you are interested in getting a Japanese style tattoo, it’s important to have an understanding of the origin and cultural significance this iconic style has. To say Japanese Tattoos come from a rich and complex history would be a gross oversimplification. 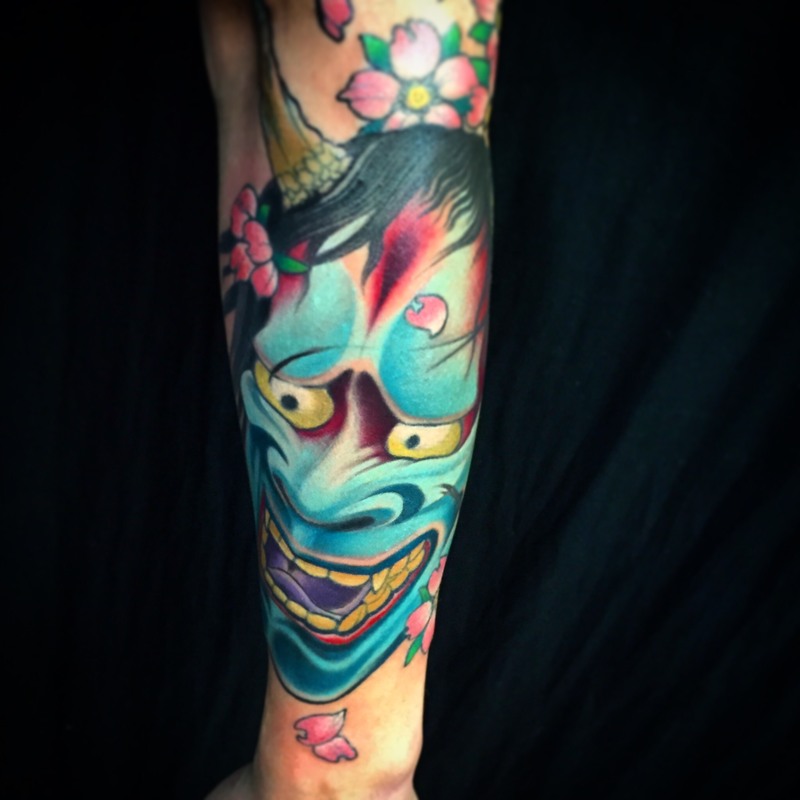 Tattoos in the Japanese culture have taken many different societal connotations throughout the history of the culture and have played a large role in the expression of their society. 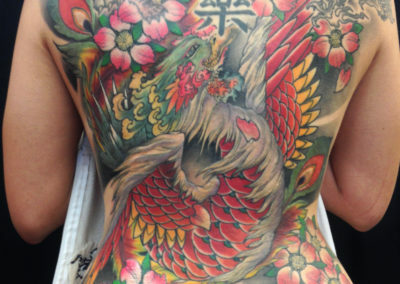 The significance and cultural understandings of Japanese tattoos have undergone massive changes throughout the history of Japan, which can be linked to massive sociological events of the time. 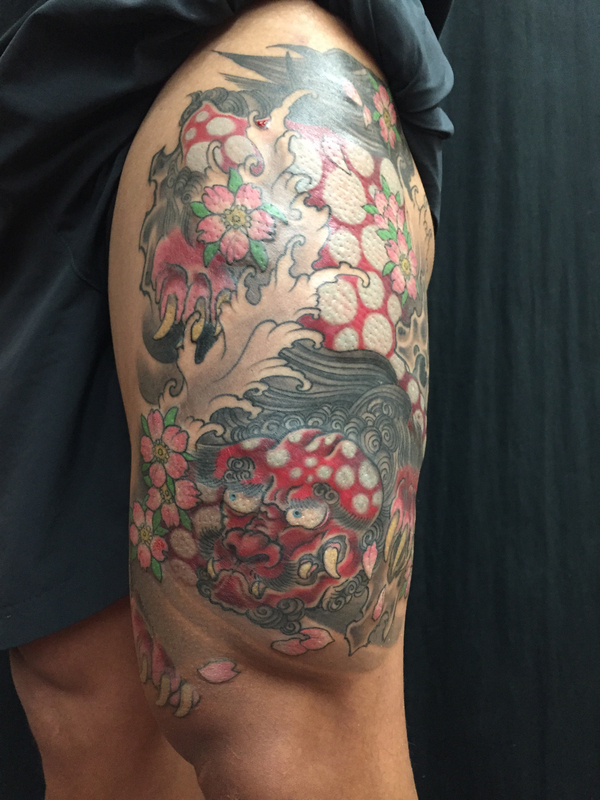 From religious and shamanistic significance, to affiliations with the Japanese mafia, Japanese tattoos have undergone massive changes in cultural significance and social acceptance in Japanese culture. 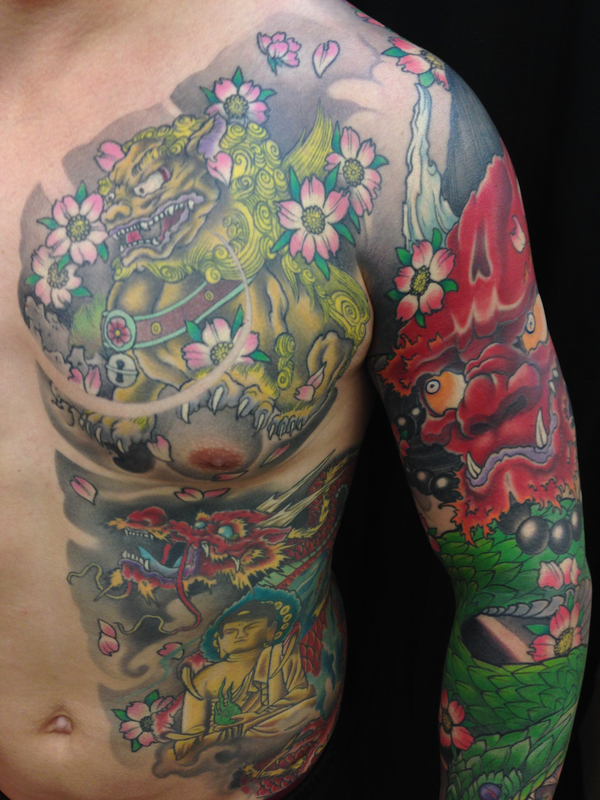 Scholars have traced tattooing in Japan to the Jōmon or paleolithic period that is roughly 10,500 B.C. to 300 B.C. Some believe that the tattoos were used for spiritual and decorative purposes. The Yayoi period (c. 300 BC–300 AD) was observed as a time when people used tattoos as means for social status and ritualistic purposes. The cultural significance began to change in 300–600 AD when tattoos were used to mark criminals. This was done to serve as punishment for those who has committed crimes and to be easily identifiable in society. 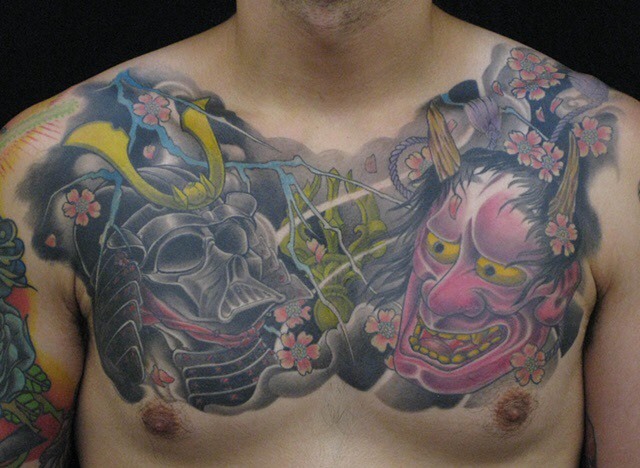 Later, during the Edo Period in the 1600’s, tattooing began to take on various social fads but was not accepting in mainstream society. 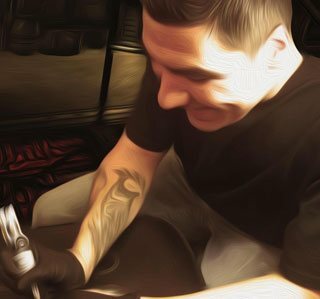 As various art forms began to flourish, tattooing began to take shape as the advanced form of body art it is known for today. 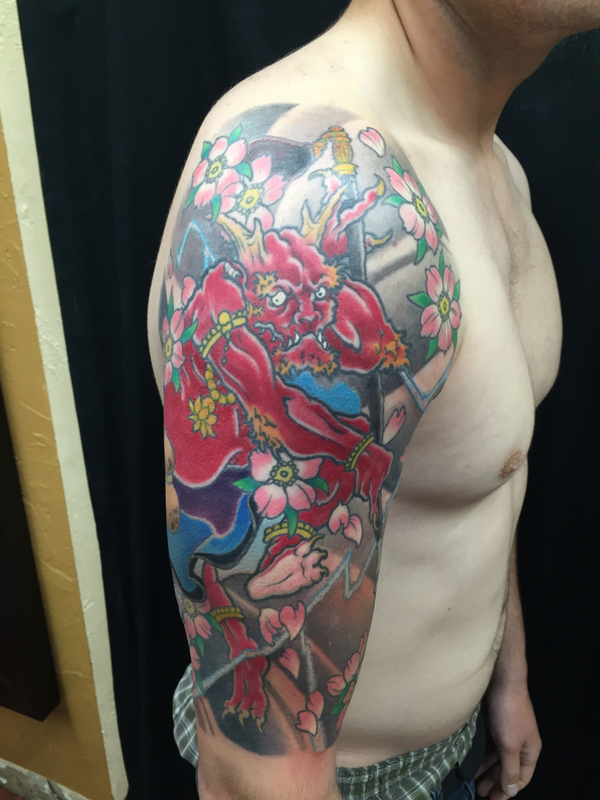 Although the Samurai elite of the time attempted to outlaw tattooing in Japanese culture, it was experiencing a boom in artistic and creative craftsmanship. It wasn’t until the threat of outside, western culture that imposed colonization of that Japan that it sent tattooing to underground. The Japanese government in the 19th century banned tattooing and body art in an attempt to appear for civilized to foreign influences, which it thought might help avoid western occupation. During occupation forces in 1948, tattooing was legalized and gena to reemerge in society. 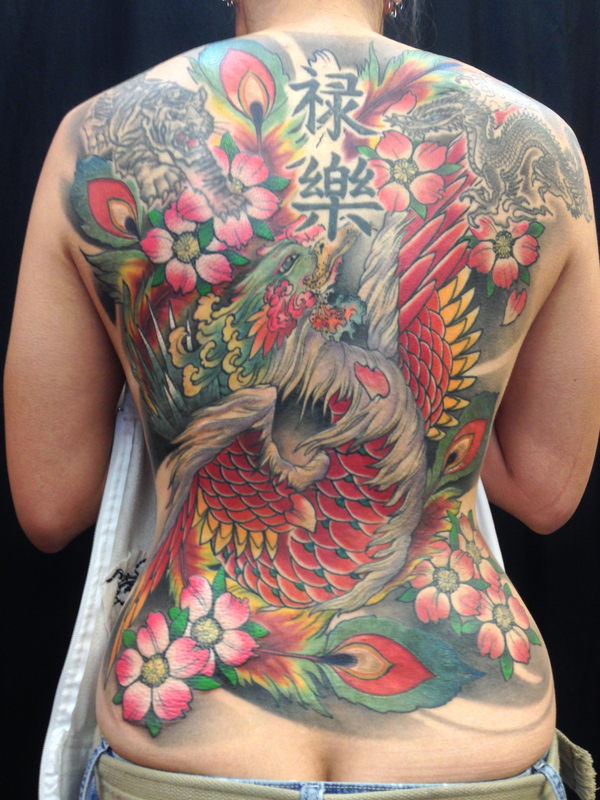 It was then that tattooing began to be associated with the Yakuza, the Japanese mafia due to movies of the time. 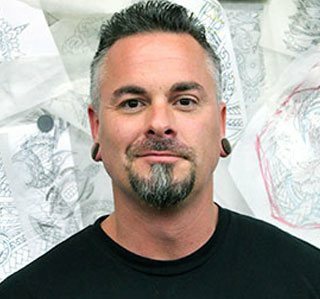 Thugs decorated with full back pieces of of tigers and dragons conquered mainstream perception of tattoos which spread around the world. It has slowly began to move away from this stereotype and since has been adopted around the world for it flowing qualities and identifiable imagery. 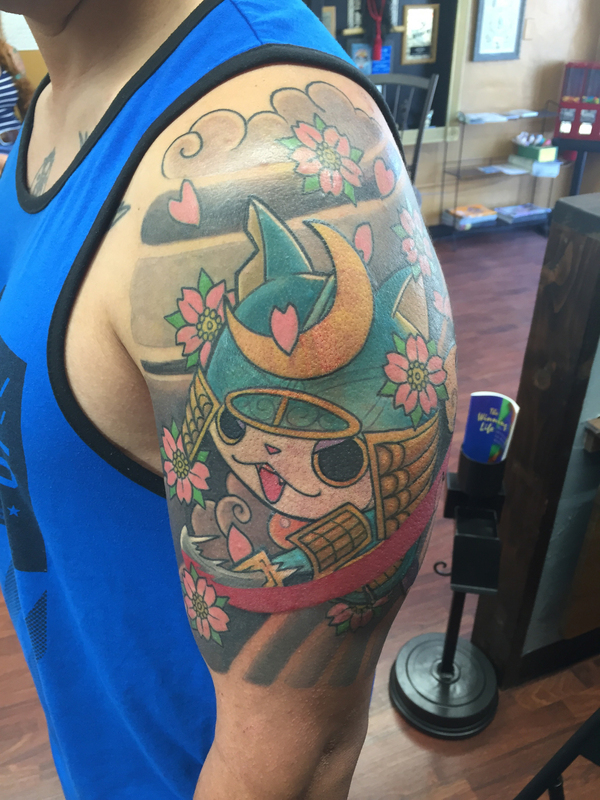 Traditional imagery of Japanese style tattoos are rooted in the mythology surrounding the animals, beasts, and objects. Each proposes unique qualities that reflect the convictions of the wearer and largely remain unconvoluted by modern day meanings. 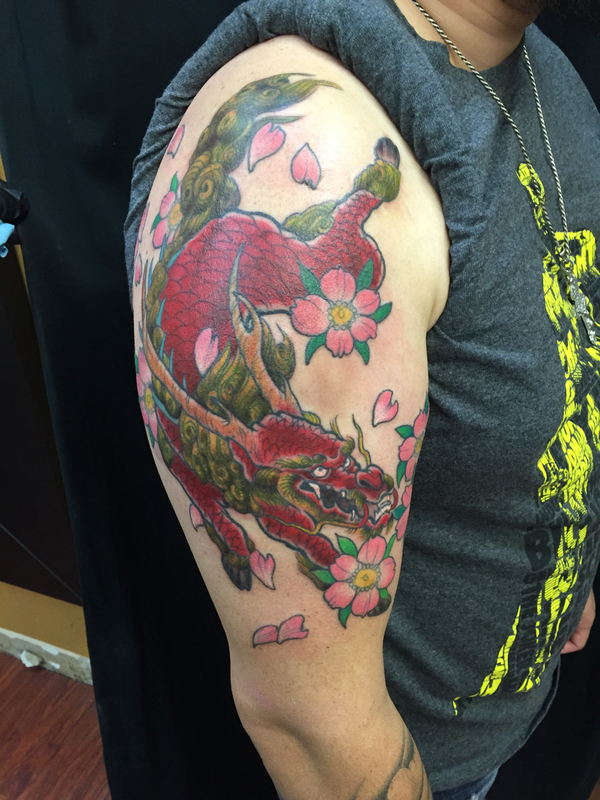 As a diverse and legendary creature, the dragon is one of the most common depictions in Japanese style tattoos. The Japanese dragon is often depicted as a wingless serpentine creature with clawed feet. 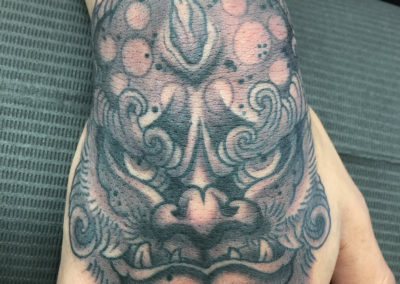 Originally identified as water deities, or associated with rainfall and large bodies of water, dragons are capable of devastation but at the same time embody wisdom and protection. They are linked to meanings of insight, benefits for humanity, power for good, and quality. Tigers in Japanese mythology have largely borrowed their meanings from Chinese mythology and are often depicted in perpetual opposition to the dragon. These are commonly displayed as the rival forces of yin and yang. However, Tigers depicted alone have strong connotations to strength, power, courage, and bravery. It has also been revered as a symbol of warding off misfortune, detestable spirits, and illness. 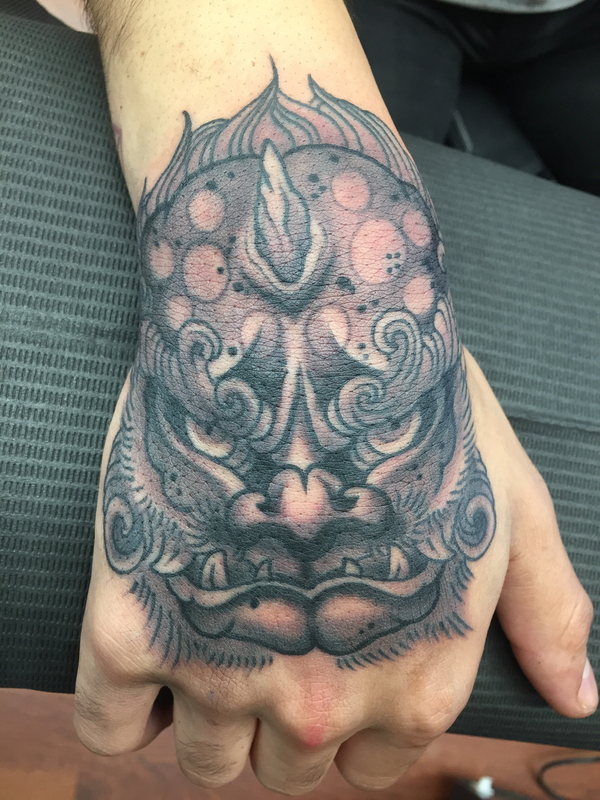 The foo dog is a depiction of a lion, dog-like beast that originates in Chinese Buddhism. This mythical beast is commonly depicted as a guardian with bold and fierce characteristic. They have associations with valor, good fortune, and solid defences. 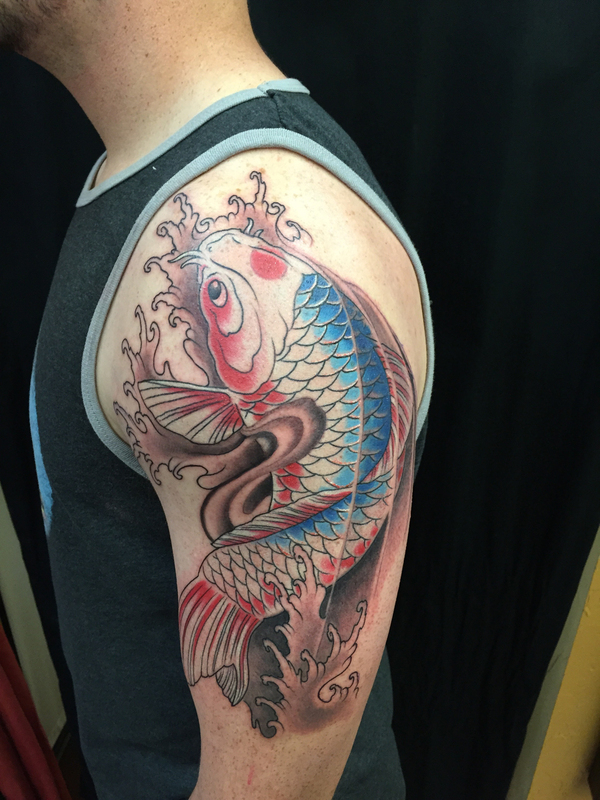 Koi is a highly respected fish in Japanese culture and has strong associations as a revered symbol. 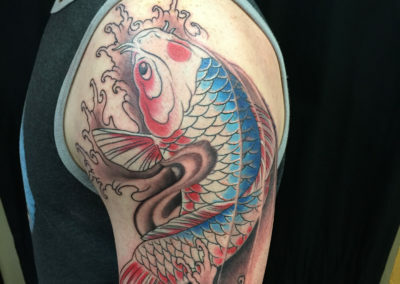 Koi meaning “carp” in English is a type of fish that symbolizes perseverance as they are seen fighting the currents of rivers and stream to swim upstream. They are a common symbol of strength and steadfastness in the face of adversity and can represent luck, prosperity, and good fortune. 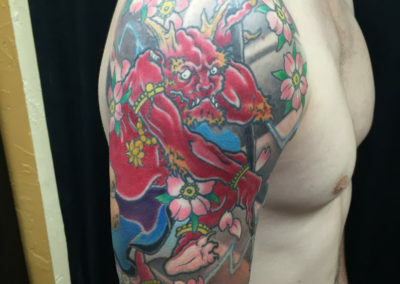 Oni are are a common depiction in Japanese tattoos and represent the mythology tied to the spirit world and the demons that torment those on earth. They are believed to be malevolent, troll-like creatures that pillage and spread disease and illness. However, not all oni are bad. Some are even viewed as protectors. Most depictions of the oni masks represent insidiousness, defenders, and tricksters. The snake has been depicted in Japanese culture as a divine feminine entity but has embodied many other meanings. 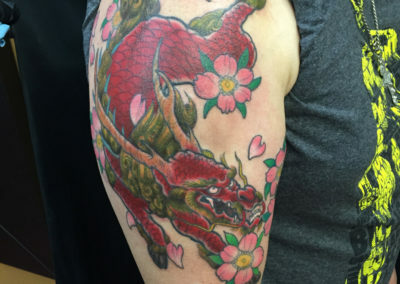 The snake used in Japanese tattoo embodies meanings of protection, wisdom, good luck, strength, and change. They are also used to ward of illness, disaster, and misfortune. 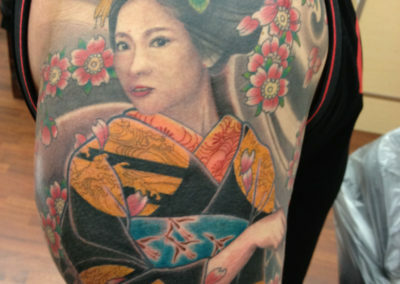 Flower tattoos are a common depiction in Japanese style tattoos and can often be used in conjunction with other imagery. They have meanings of prosperity along with each type of flower having their own unique symbolism. The lotus flower can represent understanding, knowledge, and enlightenment. Cherry blossoms are also commonly used in Japanese style tattoos and are depicted as blowing in the wind or drifting through the air. The Cherry blossom can represent a fleetingness of life, mortality, and natural beauty that is temporary. Chrysanthemum flowers also have associations with Japanese tattoos and can be associated with royalty. The chrysanthemum flower can represents meanings of longevity, happiness, joy, and even a sign of godliness. 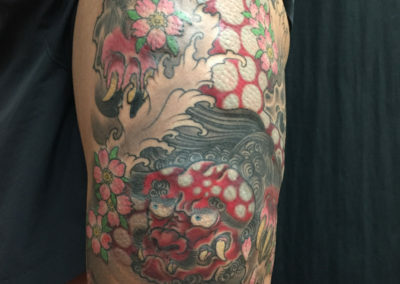 Water and waves in particular have played a large role in Japanese tattoos and artwork in general. 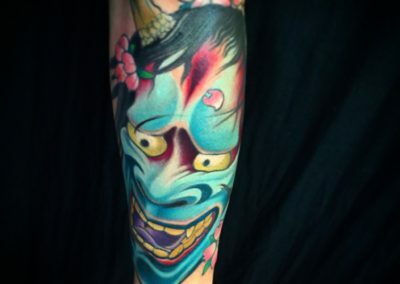 As an island, Japan and its culture has experienced massive storms and tsunamis that are then expressed in paintings, sculptures, and tattoos. The wave symbolizes strength and life, whereas water represents the concept that life ebbs and flows, like water. It associates with the strong characteristics of water, which can be powerful and destructive as well as gentle and quiet. 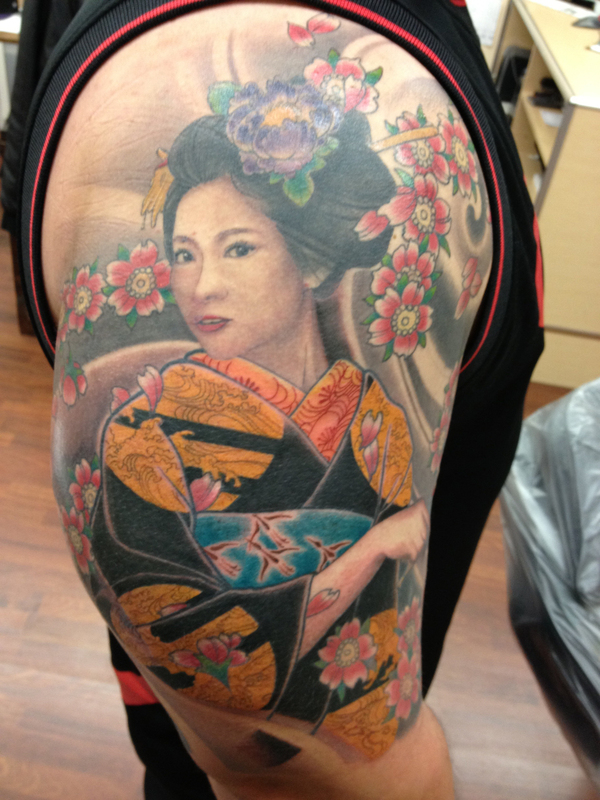 © Funhouse Guesthouse Tattoo All Rights Reserved.